1,000 pieces per bag. Measures 6 inches wide by 2 1/2 inches high. 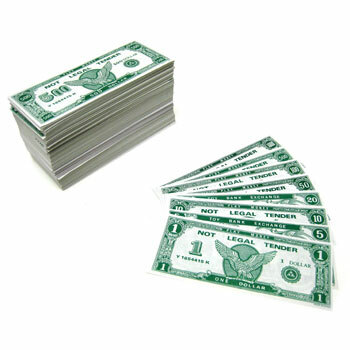 Contains $1, $5, $20, $50, $100, $500, and $1,000 bills. $5.55 per pack for 25 packs or more. $4.75 per pack for 50 packs or more.